← What Does a Curriculum Manager Do? Performance-Wise? 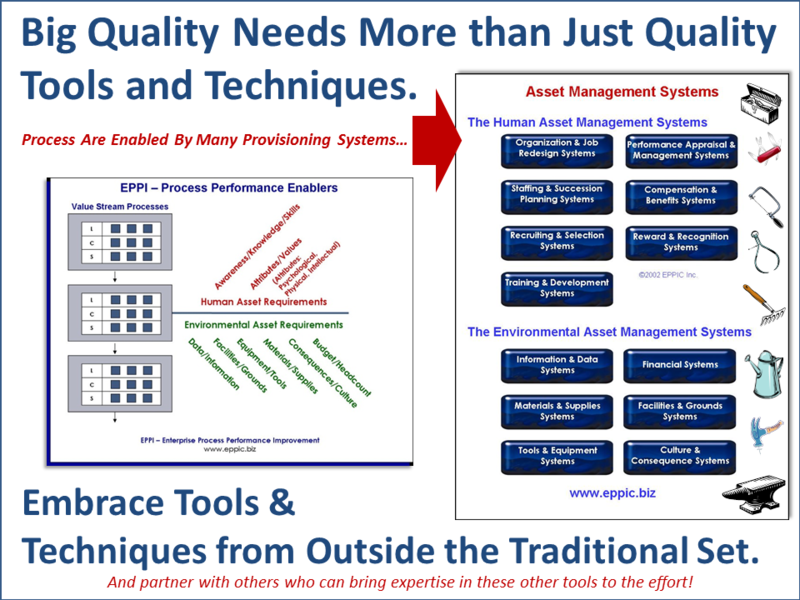 A Quality System Needs More Than Traditional Quality Tools and Techniques – And A Lot of Collaboration! I have viewed the Video interview with Dr. J. J. Irani of Tata Sons of India by ASQ CEO Paul Borawski here on creating a Quality Culture. Dr. Irani mentioned Big Q and Little Q in his response. I haven’t heard those phrases in a while – and have been reflecting on them for a few days now. He also mentioned that after trying another “System” Tata ended up using an adaptation of the Malcolm Baldrige National Quality Award as their “System” as it enabled them to use it across several diverse businesses. 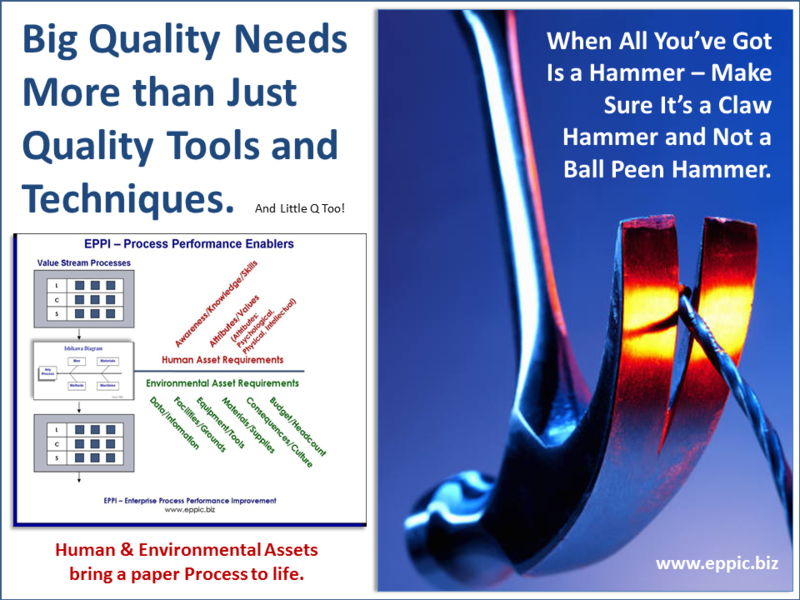 Little Quality is about the Product and Processes – and how to improve that to the needed target – sometimes to a level of Six Sigma near-perfection, sometimes not. Big Quality – all pervasive. 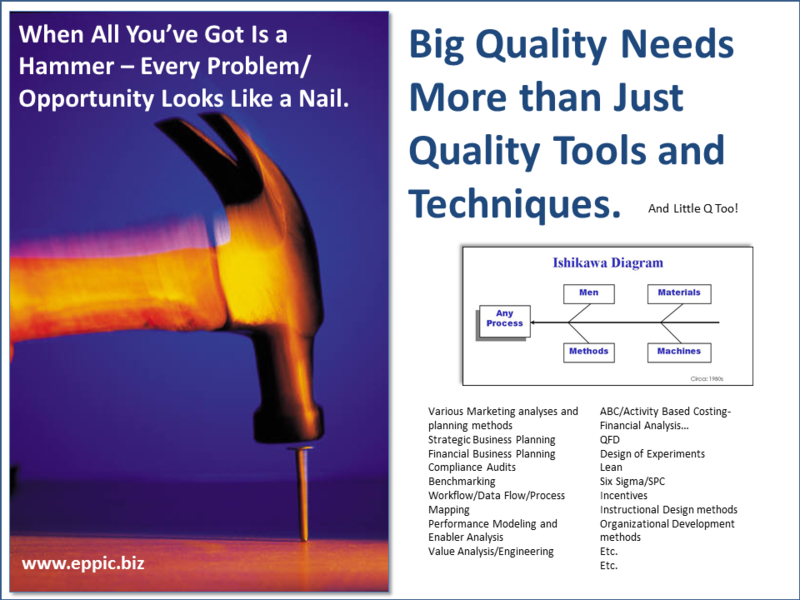 Requiring more than the typical quality tools and techniques – in my view. Dr. Irani mentioned trust and values being critical components in Big Q. I agree. Plus there is so much more. So much more in fact that I don’t think – and have thought this way for a couple of decades now – that Big Q is so big that it’s beyond any one person. No one is a master of all things Big Q. One can be knowledgeable about all things Big Q – but not a master practitioner. The variables in a process are themselves often beyond the mastery of Quality practitioners – just as they are beyond the mastery of those in “my home domain” of HPT – Human Performance Technology. HPT is a set of science-based/evidence-based concepts, models, methods, tools and techniques that overlaps – depending on who you’re talking to – with Big Q and OD – Organizational Design (or Development of OA – Organizational Alignment – or whatever YOU call such things). Regardless of your view of exactly what’s in that or those boxes – and what’s shared or unique – a no-win argument that really doesn’t advance the Voice of Quality – or the Voice of Performance Improvement – or the Voice of the Stakeholders – we – all of the folks improving process and product performance – and Enterprise performance – and people performance – all need to find better ways to collaborate and use the best of what we can each bring to the table for our Stakeholders. Our approaches need to be more collaborative and still be fast, effective and efficient. 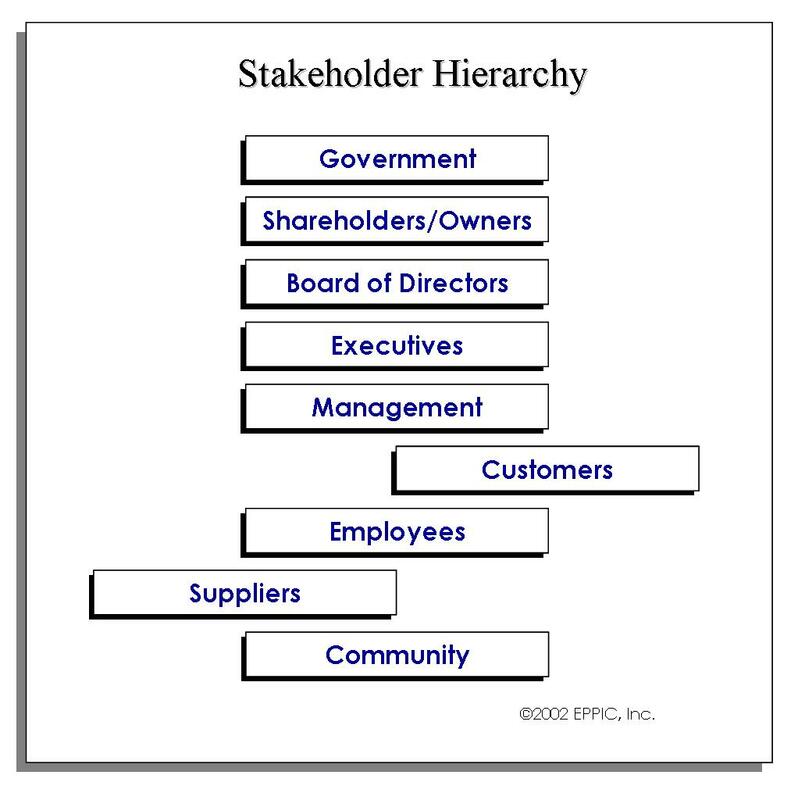 We need to meet the needs of our Customer’s – and perhaps the needs of their customers’ customers – and the needs of those Stakeholders who actually top the Customer in a Stakeholder hierarchy – example shown next – for illustrative purposes only – your view might differ. The Customer is not King – as I wrote back in 1995 – but they do lead in the definition of needs – and wants. But meeting those needs just might take you from just “Little Q” – to that plus Big Q. The real trick – as I see it – is knowing enough about other improvement disciplines – to bring them in at the right time – and not always late. How are you doing with that? How well are your serving your Shareholders and meeting the needs, wants and constraints of all of your Stakeholders? How well along are you on the road to Big Q? 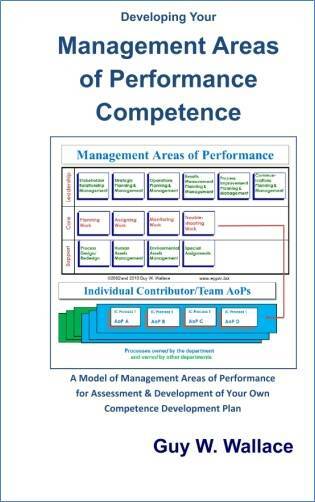 Perhaps you’ll find this book below – a recent update from my “Management Areas of Performance” book that was actually written in 2004 but published in 2007 – a help. Five years ago, if you asked most senior executives/senior managers what it took to do their jobs, or if you asked them to describe the base skills and core competencies you would get a blank stare. You would be told that the most valuable skill would be entrepreneurial. You might hear about business acumen or you might hear about leadership. You would likely be told that the most successful managers would show great creativity and organizational skills but that by-and-large, it was not possible to measure the core competencies of senior management. In 1994 I remember meeting with the senior management of a Fortune 50 company and asking what core competencies were required of the top marketing and R&D leaders of the company. We were told that one really couldn’t measure those skills. When we asked for the names of the top three marketing and R&D leaders, they had no problem coming up with the names. It took only a short discussion for them to recognize that they did, in fact, measure these skills in people, they just did not have a structured approach to do it. There was no clear process for measuring these competencies or determining that they were properly aligned with the strategic needs of the company. Here was a major corporation that prided themselves on a very detailed Strategic Planning process but had no way to determine if the primary asset responsible for the deployment of that strategy was competent to do so. Since 1988 the Department of Commerce has been presenting the Malcolm Baldrige National Quality Award to the Best-of-the-Best American companies, schools, and now hospitals. These organizations all follow the same business model, a model built on demonstrated best practices from the most successful organizations in the country. The Baldrige model calls for a detailed understanding of the needs of your customers (Customer Relationship Management), translating them into the language of the organization (Strategic Planning and Management), building organization tactics for deploying the strategy (Operations Planning and Management), developing performance improvement tactics and measures (Results Measurement Planning and Management and Process Improvement Planning and Management). If this sounds familiar to you, then maybe you have spent some time inside a Baldrige company or maybe you have already read the Table of Contents of Management Areas of Performance. This book clearly lays out an approach to describe the Areas of Performance required to deploy the leadership model and strategies of your organization. To those performance technology specialists in the crowd, you may have been trying to find more effective ways to contribute to the success of your company. Here is a roadmap that clearly ties with one of the most effective business models in use today. Guy Wallace has assembled a rock solid approach to analyze the core competencies of the leadership team to determine the gap between those skills necessary to deploy the strategies and the current state. From this position the organization can define clear strategies for closing those gaps and better aligning the leadership team and leadership system with the future of the company. Clearly, the organization that does a better job of understanding the connection between these competencies and aligning its strategies and improvement goals will have a competitive advantage over the less clearly directed organization. I think the new version of the book will do the same. For more information about that – please go here.